Until recently, there were three people living in my house. A few years ago, there were four. At the height of my semi-professional job as a laundress, I washed clothes for five people. Given that four of those people were male and the idea of conserving energy by limiting their imprudent use of towels was completely unthinkable, and given the fact that when not in school, 75% of my clientele were either working cows (can we say ewww? ), baling hay, or working in sweltering temps on a construction site, suffice it to say that the laundry room required a revolving door. I really never counted (the trauma, you understand), but it wasn’t unusual to have 7-10 loads of clothes a week in those days. Can you imagine washing all those clothes by hand in a stream of running water? Now I understand why people wore clothes for days and weeks at a time and when they pulled them off, they’d practically stand up by themselves. It’s pretty much a given that the first options for washing clothes were streams, rivers, and lakes. The water carried away the sweat, dirt, and grime embedded in the clothes. Lye soap was used when available and helped get rid of more of the grime and smells. Picture what our washing machines do today…agitating, sloshing, slapping, beating your clothes into submission. Women of yesteryear did all that with the sheer power of their arms, with wooden slats, often called washing beetles or bats. Instead of the sides and the agitating core of a washing machine, they might spread the clothes on a rock (a beetling-stone) or a battling-block or board to beat out embedded grime. …that’s what women of the past had to do to clean their family’s clothes, and this went on for thousands of years. Who ever said women were weak? Ha! Laundresses the world over eventually started thinking of ways to make this task less arduous. 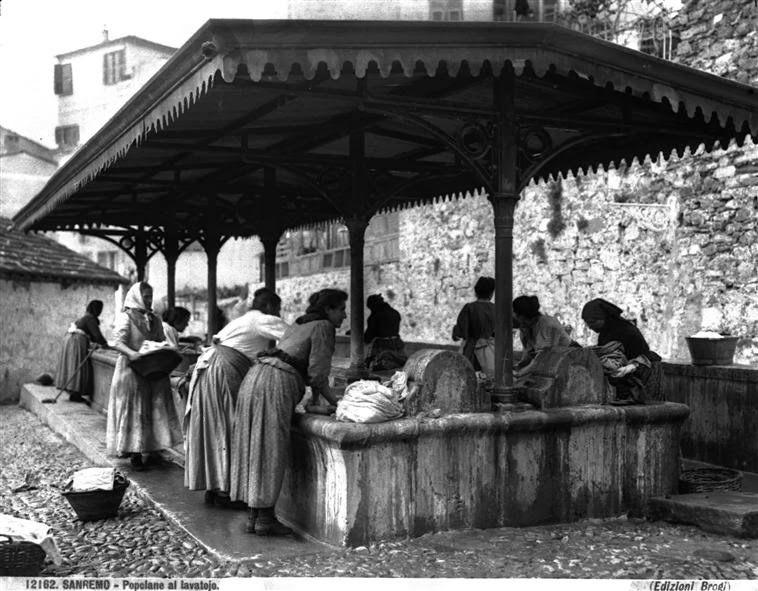 Communal wash-houses made the job easier for all concerned when women congregated to get the task done. Depending on the resources and geographical location of any given village, town or city, a communal wash-house could be as simple as a well in the center of the village with a thatch lean-to, to a heated building with separate basins for washing and rinsing with water flowing through stone troughs and basins. Carlo Brogi (1850-1925)This image is in the public domain. Usually, one particular day was designated wash-day and the women gathered to wash clothes and share news, and dare we say, a bit of gossip. Gives new meaning to airing dirty laundry, huh? As women migrated further afield and set up housekeeping in far-flung regions, they adapted as needed. In the late 1800s, any woman worth her salt wouldn’t set out in a covered wagon west without a wash tub, a scrub board, and a working knowledge of how to make lye soap. And for many reasons, she’d insist the family settle close to a nice, running stream and pray they’d have well water in due time. And other than periods of time when cold, winter months and rainy seasons played havoc with laundry, good old fashioned sunshine dried clothes and that particular commodity stayed the same for centuries regardless of the time, place, or location. Some people still prefer the fresh, clean scent of sun-dried clothing today. So, back to washing clothes. Uh, do I have to? We went from trekking down to the creek with our stinky, soiled laundry to washing in wash houses, to wash boards, and on to wringer-type washing “machines” (machine, my foot) to fully-functional electronic washing machines and driers that would make our great-great-great grandmothers’ heads spin faster than the clothes in my drier. Excuse me while I go hug my washing machine! The title of your blog made me laugh and spill my coffee. Now I want to hug my washing machine! It's so easy to take things for granted. I have a family of 6 and at one point we had 7 living here. And oh my goodness I can so understand the laundry issue. LOL. Sometime I felt like the laundress, cook and maid who never drew a paycheck. LOL. But hubby was so supportive and always said he couldn't afford me if I drew a paycheck because my work was never done. Seven??? So, you're the chief, huh, Debbie? Hail to the Chief! Anybody beat Debbie Lynne for having the most washing to do? 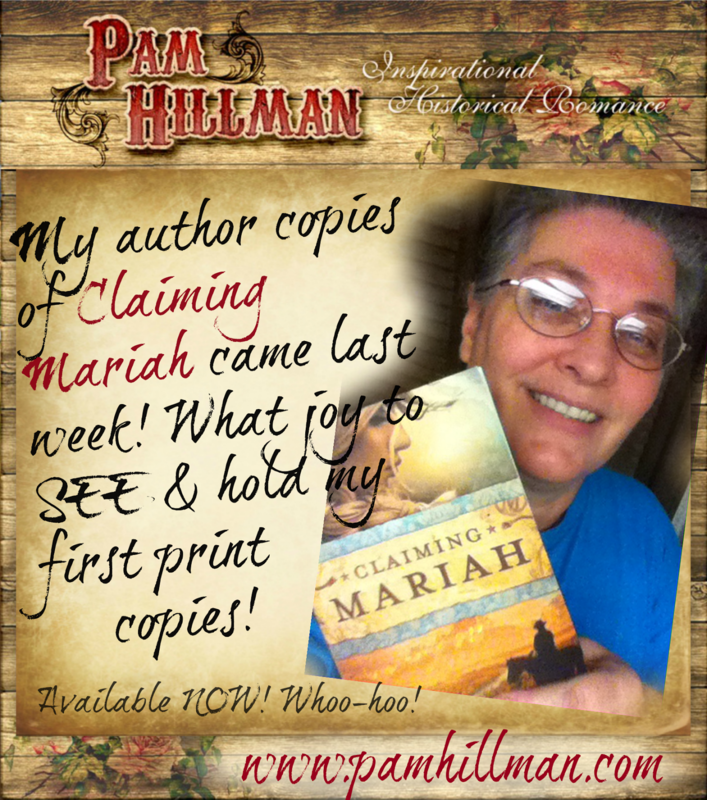 Loved this post, Pam. I once did laundry for two adults for a month by hand in the sink. Scrubbing wasn't anywhere near as bad as the wringing out... To wring out a pair of denim jeans is a lot of work! I can't imagine doing it with heavy fabrics! Debra, my hands are the same way. I'd hate to know I had to wash laundry by hand. My own clothes I could manage, mostly, because they're light weight and I don't have a dirty, stinky, sweaty job. My first memories of washing clothes is that of my grandmother's big tub with a wringer attached sitting on her back porch. She was thrilled to have such a "modern" convenience to do her laundry. She had a hose hooked up to the water and filled the tub. I had the honor of feeding clothes into the wringer. My sister and I fought over who got to do that until I went too far and caught my hand in the wringer and was up to my elbow before Mimi could stop it. I gladly gave that job to my sister after that. Got my first dryer when our second son was born. Had a washing machine with the first boy but hung the clothes on the line. I must say that most days those clothes smelled so good and fresh when I brought them indoors. We had three boys, and they were involved in sports year round. Lots of laundry and odor. So thankful for both the washer and the dryer. I don't mind the washing and drying, but I hate folding and putting it away. About our uninvited guest in the bathroom. We had a newborn baby calf to fall into a ditch. He was cold, wet and in shock when My Cowboy found him. He's been in the bathroom for 12 hours. Hopefully he'll get reunited with his Mama today. Here's the Baby Calf in my bath room. He's so sweet...for now. I hate to think what it would be like to keep him inside indefinitely. A bull in a china shop. Yep! Pam, your article today is delightful and so timely. Until last night, we had been without water for 6 days - our well pump shifted in the frozen ground and lost pressure. We've been heating water for sponge baths, cleaning dishes, etc. Today was to be laundry day! Thankfully, Justice Water Systems out of Pagosa Springs repaired the pump and restored water flo,w just before dark last night! I remember helping my grandmother heat water, run clothes through the washer ringer and hang the clothes on an outside line. When I was young that was fun. Today - not so much. Looking forward to your next article. Seriously, so glad you have water again. I know i posted a comment last night my time but its gone blogger must hate me. I would hate to have to do washing by hand. I hear ya, Jenny! I hate to think what our clothes would look like if I had to do it all by hand. I have heard that because of the diet back then things like BO were not as bad as now. They have done shows where they ate what would have been eaten back then (they did an aussie one) They ate nothing processed like today and found that the BO was way less than it is today. Oh and this was done in the Australian Summer where the temps were very high. They did swim in the river at times to cool off. but back then it was one bath a week if that also. I can imagine. It probably took days for the clothes to dry.